When perusing the crime shelves of your local bookstore, you may notice that there are a lot of stories based around serial killers. Most are narrated by the detectives or police trying to solve the crimes, some are recounted from the perspective of the perpetrator, and I have yet to see any told from the victims’ point of view (unless they belong to the former category and later become a target of the killer). 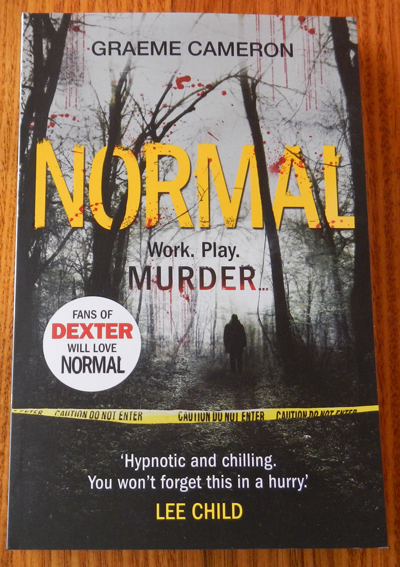 Normal is one of those serial killer novels in which the narrator is the culprit, allowing readers to view the murders from within a criminal mind. But this novel also defies the usual formulas that are placed on books of this genre, by creating a sympathetic (and strangely likeable) character whose only real flaw is that he enjoys killing people. The murderer (who is never named or physically described at all) could be anyone you know. He could be talking to a little old lady in the street, he could be walking his dog in the park or he could be filling his car with petrol right behind you. What you wouldn’t know is that he also has a cage built in his secret basement (which is hidden under the garage) and that his white van has seen more corpses than a funeral parlour. You wouldn’t know that for every grocery item you have bought at the supermarket, he has bought just as much for the girl he is currently keeping against her will in said cage. You wouldn’t know that for every white lie you have ever told, he has told a greater one to keep his secrets hidden, and to keep his victims from being linked back to him. This novel is not only original, it is also (dare I say it) darkly humorous. When talking readers through a killing scenario- which should be both horrifying and sadistic- he injects the narrative with wit and makes the process less confronting and more ‘humanised’. It’s difficult to describe, and in order to truly understand what I mean, you have to actually read the book. But somehow his character is charming, despite his oddities, and you can’t help but like him, even though he’s a cold-blooded killer. The rest of the characters are just as charming, in their own sort of way, especially when you take into account the ways that he meets them and the skewed logic he has about the best ways of dealing with them and their behaviours. Although he is a calculating murderer, at times he comes across as an innocent ‘victim’ whose life is dictated by the paths he chooses- sometimes for the betterment of others. In this way, he is similar to the character of Dexter (of the self-titled series by Jeff Lindsay). Fans of the Dexter series are encouraged (by way of a sticker on the front of Normal), to give the book a go as a result. This thriller is twisted, funny and slightly unusual but if you like crime books with a liberal splash of humour, then this is the perfect novel for you.